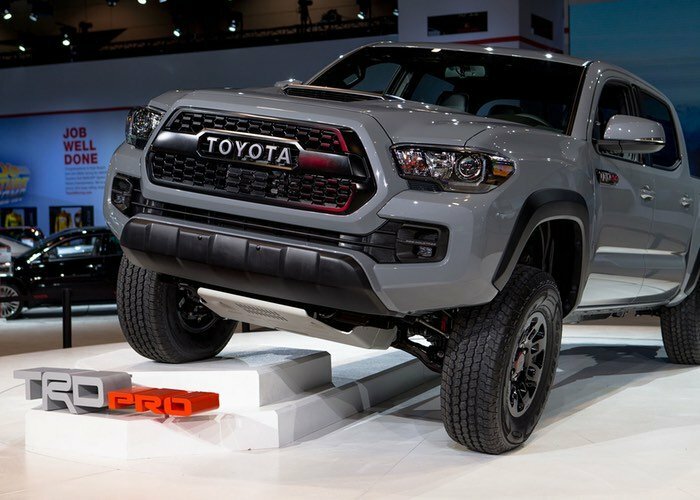 If you liked what you saw in the 2017 Toyota Tacoma TRD Pro truck and were just waiting to hear how much the truck would cost the time is here. Toyota has announced the price for the 2017 Tacoma TRD Pro and you need some deepish pockets to get one. The truck will start at $40,760 for the Double Cab with the 3.5L V6 and 6-speed manual transmission. If you want the same Tacoma with the 6-speed automatic, you will need to cough up $42,760. What you get for the money is a truck with 16-inch TRD black alloy wheels, Goodyear Wrangler all-terrain Kevlar reinforced tires, Fox 2.5 internal bypass shocks, and lots more. Those fancy shocks have 2.5-inch aluminum bodies, internal floating pistons, position-sensitive damping, and the Tacoma rides on unique TRD springs that lift it by an inch compared to normal models. Both models are subject to an additional $920 for delivery. The Tacoma TRD Pro almost sounds like a smaller Ford Raptor meant for running at high-speeds in the desert. Four-wheel drive is standard on the model and it has some unique body bits to set it apart visually from other Tacoma models.